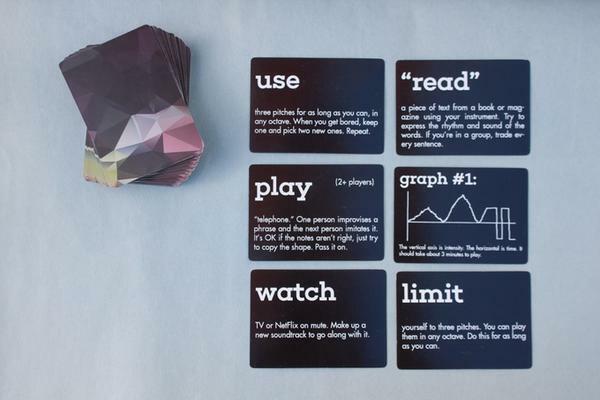 Tonic is a deck of cards that offer instant tips in the style of the famous Oblique Strategies by Brian Eno and Peter Schmidt from the 70s. The difference is that Tonic is specific to musicians. Some cards tell you what pitches to use. Others have time constraints. Some are for specific instruments. A few are visual. Some ask you to use your computer or phone. Some are meditative, and some are chaotic. Some are straightforward, and some are … a little abstract. Tonic is nice, but what makes me a bit perplexed is that the sentences are … a bit too specific. use only one interval. You are free to move it around using as many pitches as you like. play this graph The vertical axis is intensity. The horizontal is time. It takes about 3 minutes to play. 3 minutes? why 3 minutes? and why that graphic? I understand that you can say that the ideas expressed in the cards can always be reinterpreted in a different key, but for me are too … assertive, at least as to the oblique strategies that I use from time to time.